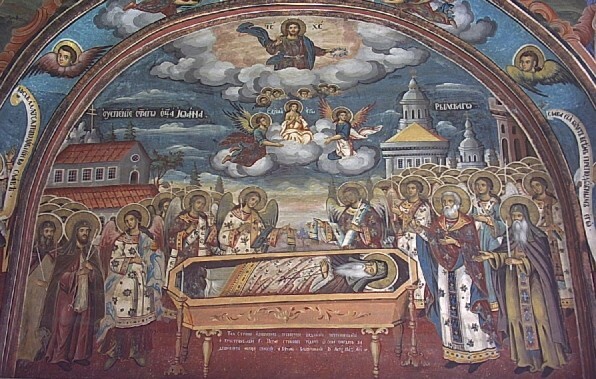 The Transfer of the Relics of the Monk John of Ryla from the city of Sredets (Sofia) to the then capital of the Bulgarian realm – the city Tirnovo, took place in the year 1238. The Monk John of Ryl'sk – a great spiritual ascetic of the Bulgarian Orthodox Church and Heavenly Protector of the Bulgarian nation, was born in the year 876 in the village of Skrino in the Sredetsk district (ancient Sredets – is now Sofia). Early on having been left orphaned, the boy became a cowherd in the avoidance of people. One time the rich man beat him for losing a cow with its calf. The boy cried long and he prayed, that God would help him. When he found the cow with the calf, the water at that time flowed high and strong in the River Struma. The young cowherd prayed, he placed on the water his own tattered shirt, made the sign of the cross over it, took up in his arms the calf and went with it, as though on dry land, – to the other bank of the river where the cow was situated. The rich man, hidden in the forest, was frightened seeing this miracle and, generously having rewarded the youth, sent him away from his home. Having given away his things, the boy left from his native village. Where and when the saint took monastic vows remains unknown. At the very first he pursued asceticism on an high and barren hill, eating but wild plants. His hut was of brushwood. After a short while robbers fell upon him by night and, having beaten him, drove him off from there. Then he found a deep cave and settled in it. There his nephew Saint Luke also soon settled. The place was quite unpopulated, so that the Monk John at first considered the appearance of Luke a devilish trick, but learning that the youth sought after salvation of soul, he lovingly accepted him. Not for long, however, did they happen to live together: the brother of the Monk John found the ascetics and by force took away his son. Along the way home the youth died from the bite of a snake. Having repented, the brother asked forgiveness of the monk. The wanderer went then frequently to the grave of the righteous youth; his beloved place of rest was there. Twelve years the monk spent in the desolate cave, and then he went into the Ryl'sk wilderness and settled into the hollow of a tree. He fasted and prayed much, incessantly wept, and ate only grass. Seeing such endurance, God had beans grow up, which he ate for a long time. This sort of beans and his exploits made him known to people. One time a flock of sheep from sudden fright ran along the hilly steep paths, and did not stop until the place where the monk lived. The shepherds, following after the flock, with astonishment saw the hermit, who amicably greeted them: "Ye arrive here hungry – pluck yourself my beans and eat". All ate and were satisfied. One gathered many beans in reserve. Along the way home he offered them to his comrades, but in the pilfered pods there remained no beans. The shepherds turned back penitent, and the starets (elder) stood there, saying with a smile: "See, children, these fruits are appointed by God for subsistence in the wilderness". From that time they began to bring to the monk the sick and those afflicted with unclean spirits, which he healed by prayer. Fleeing celebrity, the monk went from his beloved tree-hollow and settled on an high and difficult of access rock crag, where he dwelt for 7 years under the open sky. Reports about the great ascetic reached even the Bulgarian king Peter (927-969), who wanted to meet with him; but the Monk John, having written a letter, rejected such meeting through humility. Later on the Monk John accepted under him the nourishing of monks, who built a monastery with a church in the cave, where the Monk John formerly lived. He wisely tended his flock and died on 18 August 946 at 70 years of life. 5 years before his end he wrote by his own hand "A Testament to Disciples", one of the finest creation of Old-Bulgarian literature. The holy life of the ascetic and the remarkable mercies of God through his prayers were very fine a preaching of the Christian faith in the newly-baptised Bulgarian land. 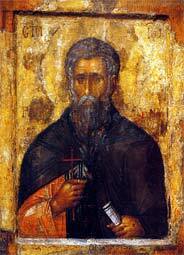 In the uneasy time of struggle of Bulgaria with Byzantium, under the west-Bulgarian king Samuel (976-1014), the Monk John appeared to his disciples, commanding them to transfer his relics to Sredets (Sofia), where the Bulgarian Patriarch Damian (927-972) was concealed. It is presumed, that the transfer of relics was in the year 980. Somewhat later the right hand of the Monk John of Ryl'sk was transferred to Russia (presumably to the city of Ryl'sk, at which was constructed a church in the name of the Monk John of Ryl'sk with a chapel dedicated to the martyrs Florus and Laurus, on the day of their memory – 18 August – on which he died). The name of the Monk John from deep antiquity was known and loved by the Russian people. Particularly in Russian sources (the Menaion for August in the XII Century, in the Mazurinsk Chronicle) is preserved data about the death of the monk. In the year 1183 the Hungarian king Bela II (1174-1196), during the time of a campaign against the Greeks seized with other booty in Sredets the chest with the relics of the Monk John and took it to the city of Esztergom. In the year 1187, having embellished the reliquary, he sent back the holy relics with great honour. On 19 October 1238 the relics of the Monk John were solemnly transferred to the new capital – Tirnovo, and put in a church in the name of the saint. On 1 July 1469 the holy relics of the Monk John of Ryl'sk were returned to the Ryl'sk monastery, where they repose to the present day, granting graced help to all the believing.